As I explained in another post, Evernote Analysis, Evernote Analysis function has been added to MyStats from V.1.30. In this post, I will introduce some advanced information of this function. Although Evernote information is imported once a day automatically, you can also import the latest information manually. Take a look at the Daily Activity Record screen. 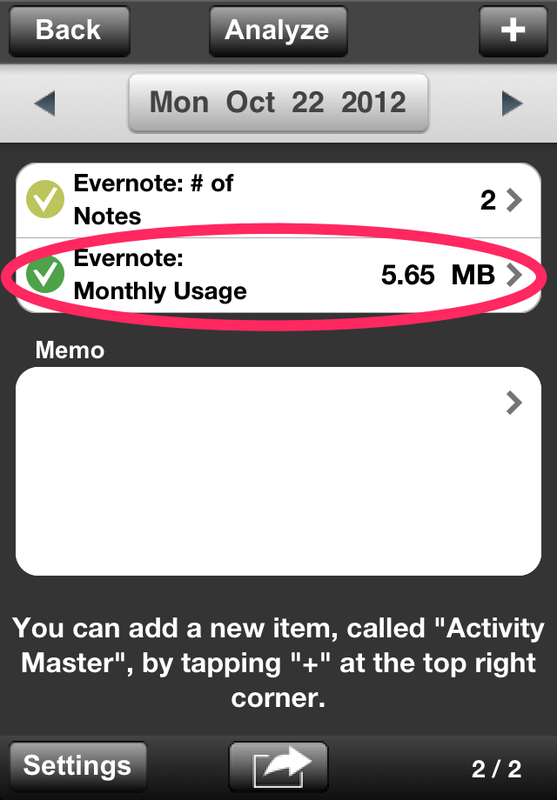 By tapping on "Evernote: Monthly Usage", you can import the latest information. You can also tap on "Evernote: # of Notes" and you will see the message below. You can import the latest information by tapping on "Only unupdated data". You use "All data" only when you want to delete all of the imported # of Notes data and re-import everything. You might want to use it when you re-organize a lot of old notes. 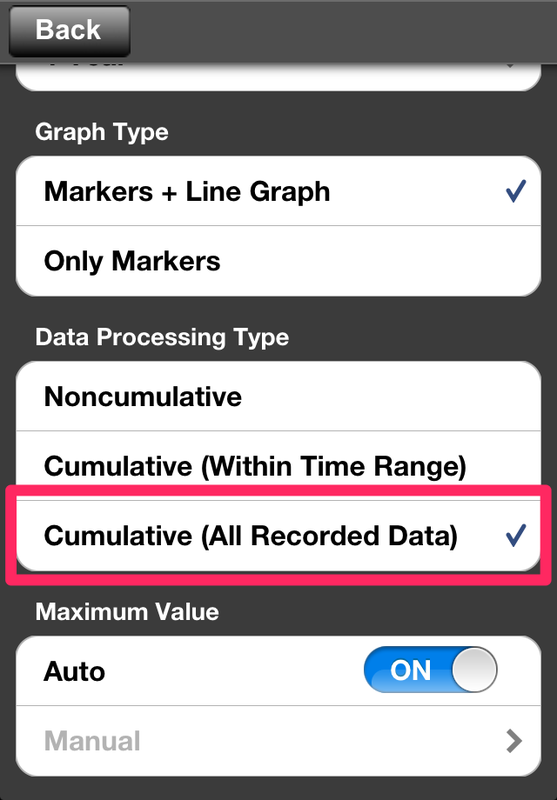 We have added a new item for Data Processing Type in the Line Graph settings. In the older version of MyStats, you only could cumulate data displayed in the Line Graph. 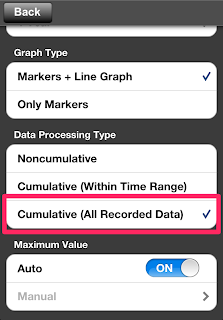 Now you can select "Cumulative (All Recorded Data)" and cumulate all of the data you have. In order to show your life-time Evernote information, we needed to add this new function. Of course you can select this item for any other Daily Activities. If you want to know how many sit-ups you have done within the last two years, you can see it. By the way, MyStats handles data only from 2010 and beyond. So if you started using Evernote in 2009 or earlier, all prior data will be summarized and added to January 1st of 2010. 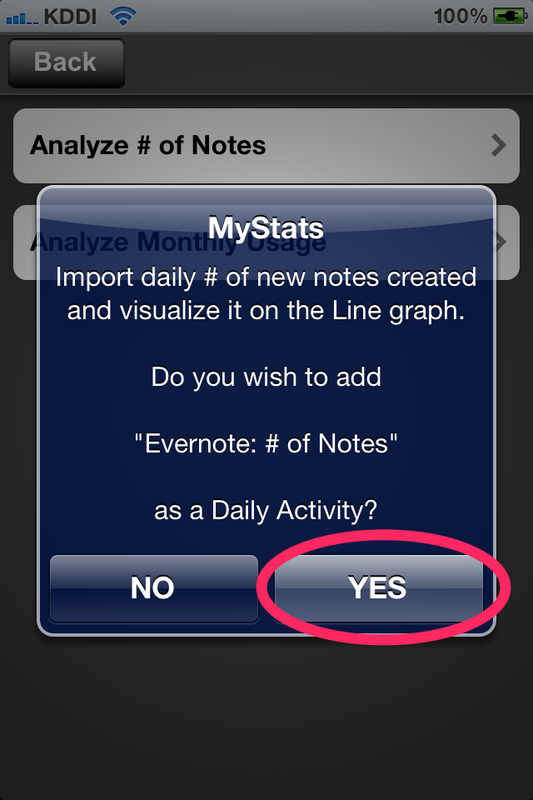 Evernote Analysis function works with iOS4.2 or later. It works on iPhone 3GS or later, iPod touch 3rd Generation or later, and any iPad. If you use iOS4.1 or earlier, please update your iOS. 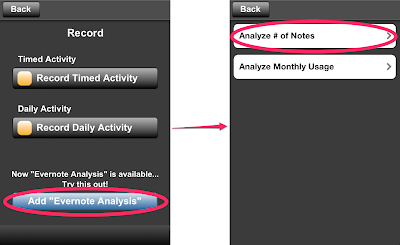 Evernote Analysis function has been added to MyStats from V.1.30! This new function came about in a brainstorming with Evernote people and Kenji (Creator of MyStats) which took place during a visit to Evernote headquarters in Silicon Valley. Another aspect of this new function is that it is the first external data handling function of MyStats. Moving forward, we will be adding more new functions which handle the data of other services and apps. 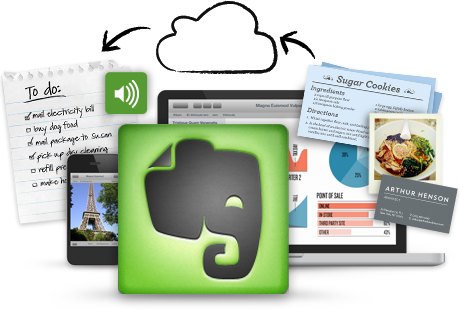 By the way, do you know Evernote? It is a service with which you remember everything. You can store text, PDFs, photos, web pages, and anything in Evernote and access your data through a PC, iPhone, and various devices wherever you are. 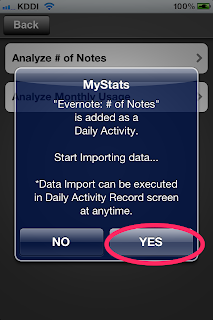 The "Evernote Analysis" function of MyStats was developed for Evernote users. If you are not an Evernote user, you can become one now. 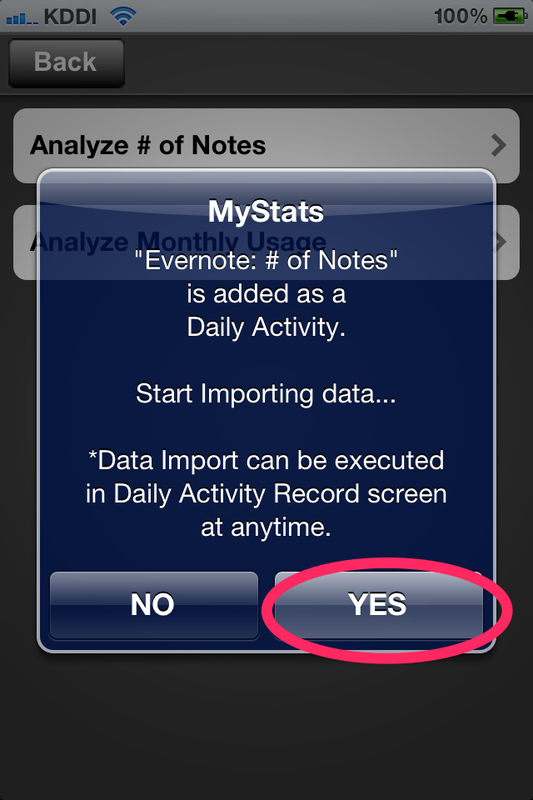 Try Evernote with MyStats. Both are for free! and visualize it with Line Graphs. What you can get is "# of Notes" and "Monthly Usage". Let's see the step by step instructions. 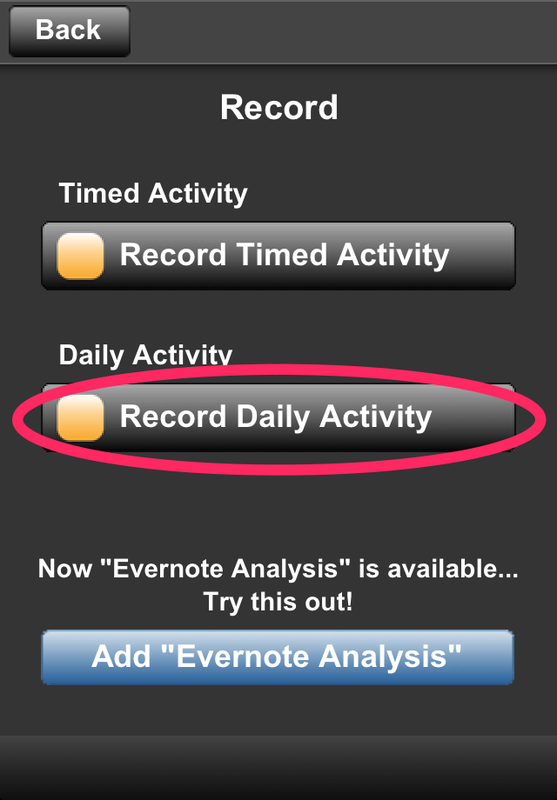 Tap on the new button "Add "Evernote Analysis"" on the Record menu, and then tap on "Analyze # of Notes". and then, import data by tapping YES, again. If you are not logged in to Evernote, the login screen will appear, so login to Evernote. That's it. You are done with "# of Notes". In the same way, let's also add "Monthly Usage" and import data. Now you are ready to analyze them. Access the Daily Activity Record screen from the Record menu. You can see the new Daily Activities you have just added. you can see how you have created notes ever since you started using Evernote. Let's check "Monthly Usage" as well. What you see here is just a dot. It's because only current Monthly Usage information is available at Evernote. We cannot access past data, like yesterday or last month. So what you can see here is only today's data which you have just imported. However, as long as you keep this Daily Activity and launch MyStats on a daily basis, Monthly Usage information will be imported automatically. So with no efforts, after a while, you will have a Line Graph like this. 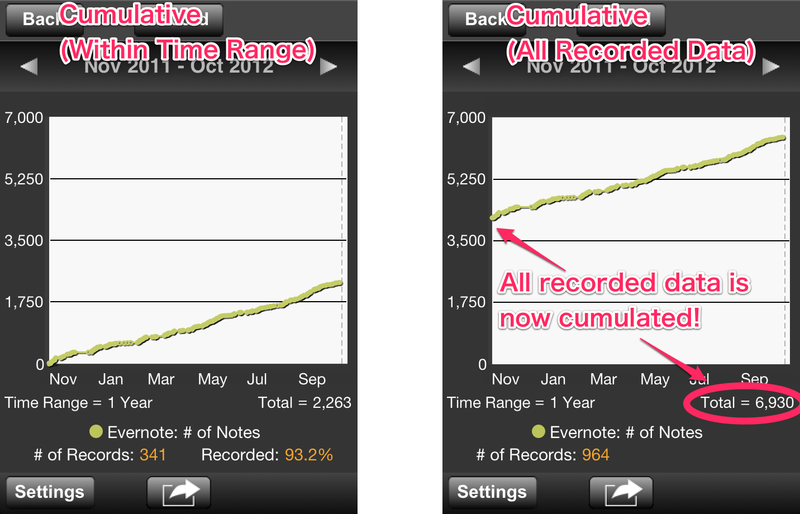 In Evernote, you can find out what your current Monthly Usage is at anytime. But as I said, you cannot see past information. 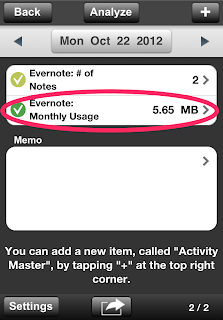 "How much did I store in Evernote last month?" If you wanted to know, there was no way to find out. With the Evernote Analysis function of MyStats, just by using MyStats, Monthly Usage information is recorded automatically and you can see it on the Line Graph. If you are new to MyStats, please start using MyStats with very simple activities, such as Weight, Time I Got Up, and so on. 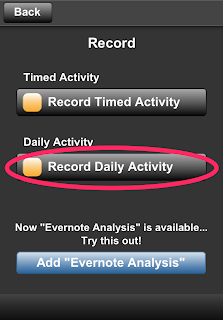 If you want to know more about the Evernote Analysis function, please see Evernote Analysis - Advanced.